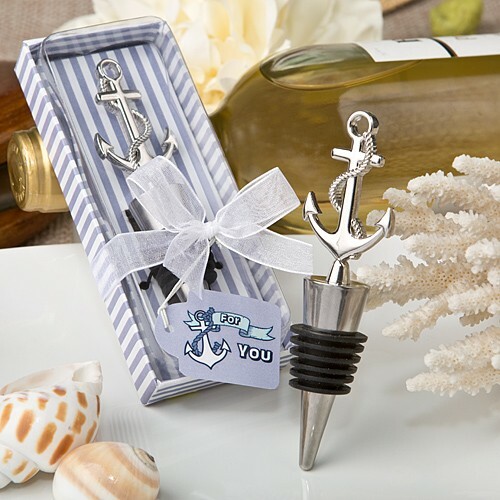 Stylish, elegant and beautifully crafted, this nautical themed favor will impress your guests at your sea side venue. Add a simple and refined look to your tables when you seal up your bottles with these stunning silver metal anchors. Every nautical themed event needs a few of these on the tables to create a classy finish and offer a great favor for your guests! The anchors are styled in a classic iconic shape with a rope winding down from the top. The anchor sits atop a bottle stopper which is made from stainless steel and has a black rubber gasket for a secure tight seal. These classy favors are perfect for showers, weddings, parties and holiday-by-the-sea events. Add a touch of the ocean to your occasion and give each guest a useful and long lasting favor to remember you by. Size of anchor is 4 1/4 " x 1 1/4". Packaged in nautical design blue and white stripe bottom box with a clear acetate top. Inside stage has matching blue and white stripes. White organza ribbon and 'For You' message with anchor card. This stylish gift from our nautical collection is sure to create a stir at your special occasion!